The Case for Germany. Our Future Policy Towards Germany, and The Hitler Youth Movement, by A. P. Laurie. The Peace Pact having been signed with Germany, and the German people in Central Europe having accomplished their union under one Reich, with the exception of one minor area, Danzig, the question before the people of this country is what is to be our policy towards Germany in the future. We must agree that it has not been a wise policy in the past. While on the one hand admitting that the conditions forced on them by the Treaty of Versailles were unfair and would have to be revised, on the other hand instead of arranging with them that the revisal be done by agreement, we have protested against every step they took in this direction. Why could we not have done what we did in the case of Turkey in agreeing to the fortification of the Dardanelles? - a matter much more vital to us than anything happening in Central Europe. Either we could have adopted the policy of the Opposition, said No, and been prepared to back our No with war if necessary, or we could have agreed to the revisal by mutual consent. Mr. Chamberlain, in arranging for a conference of the four Powers to settle the Sudeten German problem, has adopted the policy which we should have adopted from the beginning. The Sudeten German question differed from anything that had happened before, as up to that time Germany had been engaged in internal re-organization and in completing, by the union with Austria, the policy begun by Bismarck, - a policy which was entirely their own affair. The problem of Sudeten Germany was the first to involve the interests of another state, and was further complicated by the alliance between Czecho-Slovakia and France. Germany was therefore quite right in accepting the offer to settle the matter by agreement according to the promise made by Hitler in his speech of March 7th 1936. Mr. Chamberlain having initiated this new policy of consultation among the four Powers on any point of disagreement, it is all the more necessary to define our attitude towards Germany. In order to be able to do this, we must begin by considering what are the vital necessities of the German people, and whether there is any reason why we should oppose them. In considering this question we must put on one side our democratic sentiments, and our disapproval of some of the things the German Government have done within their own country, and look into the question on a purely business basis from the point of view of our Imperial interests. To deal first with the needs of the German people. There are 80 million Germans living on a small area in Europe with a comparatively poor soil, who cannot like the French obtain all the food they want from the fertile soil of their own country. It is therefore evident that they must either be satisfied with a very low standard of comfort and an underfed population, or develop external trade, or undertake military conquest of new territory. In spite of the alarm of the Opposition, we may dismiss the idea that Germany is meditating ventures of military conquest. Such a policy must result in ruin and disaster, and though partly successful would not improve her economic position. Even if Hitler is the military filibuster which the Opposition foolishly imagine him to be, we may take it for granted that the average German citizen would rather trade than fight. The days of military conquest and subjugation of other nations in Europe are over, as there is no genuine economic advantage to be obtained from it. This is clearly perceived by the German people and in course of time will doubtless be understood by our own politicians who in this matter are mentally behind the times. The only alternative therefore is extended trade, and Germany is making every effort she can to carry out this policy. While trading with any and every nation, she has looked round the world to see whether there is any region open to her which is economically undeveloped and which would supply her with the raw materials she requires. Putting on one side for a time her claim for colonies, and realising the importance of doing nothing to arouse the jealousy and suspicion of Great Britain, she has agreed to a strict limitation of her fleet, and is looking for a development of trade on land areas. If we look at the map of Europe, we shall recognise that the obvious direction for her trade expansion is in the countries situated on the Danube and beyond that the Balkans and Turkey, along the lines of the old overland trade route from Asia to Europe. She has already developed a considerable trade with the states on the Danube and with the Balkan states, and is projecting a great canal taking ships up to 1500 tons to connect the Rhine with the Danube. There can be no question that there are great possibilities of development in these economically backward countries, and that Germany will be of the greatest assistance to them, enabling them to take advantage of modern scientific methods of production. Although she has been compelled by her economic position to enter into special trade agreements, she is not attempting to claim any monopoly and if she is successful in developing these countries economically, we shall reap some of the benefits. Surely with our world trade and vast Empire, we can allow Germany to cultivate this garden lying at her door. Doubtless these countries will be included in the German "sphere of influence", whatever that may mean. I cannot see that this is any business of ours, as no vital interests of the British Empire can be affected by the development of trade in the central parts of Europe. It is the right of every nation to adopt the form of government they prefer, and we have no more right to try and compel nations to adopt our political theories by acts of war than the Roman Catholic Church has the right to crush Protestantism by promoting war in Europe. We are a business people engaged in world trade and, avoiding all ideologies, we must look at the whole question from a purely business point of view. To repeat the famous phrase of Bismarck with a difference. - The whole of the Balkans is not worth the life of one British soldier. Surely possessing the world and the fatness thereof, we need not grudge her this line of development. There are rumours that the Soviet is breaking up and that the next great national movement is going to be in the Ukraine which formed an independent republic after the war and was afterwards massacred into submission by the Soviet. The Ukrainians in Poland who have been badly treated by the Poles are demanding Home Rule, and the Ukrainians in Czecho-Slovakia are evidently in a restless condition. The Ukraine includes the black soil wheat area of Russia on the Dneiper, and could supply unlimited wheat to Germany in return for manufactured goods and will naturally enter into close relations with Germany who will be her natural protectors against the Soviet. Therefore if once an independent Ukraine republic was established and entered into friendly relations with Germany, we should be glad that the essential needs of Germany for raw materials had been satisfied. To quote Hitler, "A nation which is satisfied and well-fed is more likely to keep the peace than a nation which is dissatisfied and hungry." Ah, our Opposition will reply, but Germany will be exercising throughout all these regions that vague and mysterious thing called a sphere of influence. As long as they are exercising a sphere of influence [that] results in these nations being contented and well supplied with goods, and therefore secures the peace of Europe, why should we object, and oppose these natural developments which are inevitable because they are based upon the facts of geography. The answer is there is no alternative plan except to make war on the German people and reduce them to such desperate impoverishment and slaughter of so many of their youth, that they are again brought to their condition after the Thirty Years War and will require a century to recover. Mr. Lloyd George says we can crush them like an eggshell. He would find the eggshell made of tempered steel. I have searched the pages of Hansard containing the speeches of the Opposition in the recent debate on a vote of censure against the Government's foreign policy, with a view to finding out what is their alternative policy to the one advocated by Mr. Chamberlain. This alternative policy was given by Mr. Dalton and is worthy of quotation in full. "There is once more a possibility, it may not last much longer. There is still one more chance for British diplomacy to bring together into an effective combination all those nations in the East of Europe who are threatened by this German push to the East. They are still there a potential combination, the Soviet Union, Poland, Rumania, Yugo-Slavia, Turkey and Greece. They are all members of the League of Nations, to which we and France still belong. You have still there a potential formidable force if it could be welded together for peace and for organised resistance to further endeavours to dislocate Europe." It is unfortunate that men in the responsible position of leaders of the Labour party should be so ignorant of the real situation in Europe to-day. Germany far from dislocating Europe is consolidating Europe by helping to adjust the injustices caused by the peace treaties, and has no intention of threatening any of these countries with aggression. France who has signed a peace pact with Germany and is anxious to develop her trade relations with her, would not support the Labour policy, and the Soviet is too busy with internal affairs and with Japan, to indulge in the venture of a European war at the call of our Labour party. When Mr. Dalton's delegate called on the governments of Poland, Rumania, Yugo-Slavia, Turkey and Greece, they would receive his proposals with astonishment, and tell him that they were much too busy making profitable trade agreements with Germany. Mr. Dalton had great hopes of the new Prime Minister of Hungary. If he had listened over the wireless the other day he would have heard the Prime Minister saying that the closest bonds of friendship united Hungary to Germany and Italy, because they would be for ever grateful to them for enabling them to recover their stolen territories from Czecho-Slovakia. Our policy in Europe in the past has been called securing "the balance of power" which meant that if ever we thought one nation in Europe was getting more powerful than the other nations we made it our business to promote war against that nation, and to support war when it came with our money bags, our fleet and expeditionary forces. This policy is openly advocated by Mr. Ramsay Muir who glories in the days of Marlborough and Wellington, and wishes to see them come back again. There can be no question that this policy of the past has cost Europe millions of lives on a hundred battlefields. We not only promoted wars but when war had once begun supported its continuance with our money bags until the war, to quote Mr. Lloyd George, was "fought to a finish", with the result that it ended probably in an unjust treaty which opened the door to future wars. Can anyone doubt now that if we had adopted Lord Lansdowne's policy in 1917, and made peace with Germany then, we should have saved all the dangers and difficulties of the last twenty years. To my mind the policy of the Balance of Power is a damnable policy. We have been in the past the evil genius of Europe. It is surely evident that if the policy of the Opposition was adopted, and could be successfully carried out, blocking Germany's natural trade expansion in the Danube basin and in the Balkans, the German people confined to a limited area with no hope of commercial development, would be compelled to fight in order to live. The choice therefore is between Mr. Chamberlain's policy of allowing Germany a free area for commercial expansion, or war - a war in which Germany would be fighting for her life. The maddest of all nightmares from which the Opposition suffer, is that Germany would attempt a military conquest of the Ukraine. Either she would have to march six hundred miles across Polish territory, to which Poland would naturally object, or if she marched through Czecho-Slovakia would find herself lost in the Carpathian mountains, with no railways or roads, and would still have to violate either Rumanian or Polish territory. The one thing that would save the Soviet, if it is true that it is breaking up, would be an external attack. The difficulty that Germany and Italy find in dealing with democracies, is that they have no continuity of foreign policy, and therefore States with a stable form of government and a continuity of foreign policy have to be very cautious in their approach to France and Great Britain. France, where the members of the Cabinet are paid their salaries weekly, and Great Britain, where the old policy of continuity of foreign Policy has been abandoned for the pursuit of opposite policies by the Government and the Opposition. Since the peace pact with Germany was signed, there has been an outburst of attack on Germany, which started before the new decrees against the Jews, in the Press, by politicians, and from the pulpit, and Germany is naturally anxiously watching to see whether the next election will return the parties of the Left to power, who would denounce the treaty with Italy, and seek for some pretext to declare war on her. In every capital in Europe, the triumph of the parties of the Left in this country at the next election, would be taken as the red signal for war. We regret in England, and many Germans with whom I have discussed the matter share the regret, that the German Youth movement so closely following the model of the Boy Scouts, has been made into a separate organization. They told me that more than one imitation of the Boy Scouts movement had been started in Germany and that it was essential at the present stage of the training of the whole country to a new conception of a Nation of people, bound to service and the development of the German national life, to have a separate German organization. I sympathise with the German point of view and am glad that the friendliest relations have been established and exchange of visiting members arranged, between the two organizations. The lie has frequently been repeated in this country that the German Youth movement is military in its object and practice. This is an invention of the enemy and is not true. I owe the following account of the Hitler Youth Movement to Baldur von Schirach. Nothing is more suited to a friendly exchange of opinion between educationalists of different nations than the matter of youthful upbringing. The more the youth leaders in the various nations of culture succeed in agreeing on certain fundamental points, the more chance there is of our young people growing up in a friendly spirit toward each other instead of antagonistic. In this field of international understanding the aim should not be to effect certain political ideas and maximes but rather the more human aspects, those of mutual respect, comradeship and real sincerity. The more the youth of all nations gets to know each other by means of personal contact the more it will come to respect each other's individualities and to understand existing differences, for each country produces the kind of youth movement expressive of its characteristics and its nature. I am convinced that the Hitler boy, just as the English boy scout and the small fry of the Italian Balila, typifies the essential qualities of his native land. The National Socialist Youth developed in 1926 out of an enthusiasm felt by a few young Germans for the personality and the ideas of our Führer. The principle laid down in the very beginning - "Youth must be led by youth" - supplies the necessary balance to pure School education by the early shouldering of duties and personal responsibility. The mistakes that may still be found in this system and its possible deficiencies, in my opinion, fade away when faced with the enormous gain resulting from the early development of responsibility and the attendant stimulus to exert all faculties. The key to each situation is efficiency and the efficiency of a young person is no less valuable than that of an older one. During the development of the Hitler Youth Movement the necessity arose for organized formations. Apart from the fact that the girls were organized from the very beginning in a special body known as the "B.D.M." (Association of German Girls), the boys from 10 to 14 grouped under the "Young Folk" and from 14 to 18 as the "Hitler Youth", all these were divided up into a special system of units. The training of leaders for these various units takes place in special training schools which are almost without exception to be found in beautiful surroundings. Here they go in for sport, receive physical training and theoretical instruction in the theory of life with the team spirit pervading everything. Young Nation", broadcast throughout Germany, the uniform spirit is inculcated. By camping is naturally meant tent life which provides an equable balance for the city lads, above all for the industrial workers. The days in camp are spent in play and the evenings round an open space with singing and performances etc. Opportunities are given for swimming and riding. Last year about one million youths slept out in tents and we hope before long that there will be no Hitler boys who have not spent at least three weeks a year out camping. The hiking Hitler youth is afforded cheap night lodgings through a special organization and facilities for sojourn. This is the German Youth Hostel Association. There are some 2,000 hostels scattered throughout the country in castle ruins or old town turrets and the like which are especially maintained for the youthful wanderers [i.e. hikers]. Referring now to the essential political aspect of my organization I should like to point out first and foremost that today as from the beginning the pride of the Hitler Youth is the fact that the young workmen are with us whom we have been struggling to win over for so long. 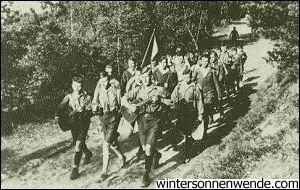 With the advent of the régime the struggle of the National Socialist youth was by no means ended; on the contrary, the hard fight for effecting the claim to totality began and with it the decisive question whether other organizations and units aside from the Hitler Youth should have the right to train the rising generation. National Socialist Germany maintained then as now that outside the schools there should be no educational body in Germany other than the Hitler Youth. This viewpoint was propounded in 1933. At the commencement of 1934 the inclusion of all protestant youth was provisionally completed and outside the Hitler Youth there was only one other youth organization, a catholic one, all other belong to our community, the fellowship of young Germany. Nevertheless, there is a plane on which the confessional organization is essentially justified and recognised by the Hitler Youth. If the former refrains from exerting temporal powers and confines its sphere of influence to matters of the soul I see no reason why there should be no confessional organization of the youth of the country. And now with reference to something of material importance. Of all the Hitler Youth activities I would like to touch on but one here, namely, the Reich Crafts Competition which the youth of Germany organized in conjunction with the German Labour Front. This is looked upon by the young people as the most idealistic avowal of an entire generation to German Labour. In his "Wilhelm Meister" Goethe denoted respect as the keynote to all education. The youth whose leader I have the honour to be is aiming at this ideal in the spirit of the great Master who has named it as the aim of the world youth common to all and uniting all. When Hitler was reviewing the Hitler youth in Nuremberg the other day he said, giving us a glimpse into the heart and soul of the man, "How wonderful, how beautiful are the children of Germany".